It has been a month and a week since I quit drinking soda. I did not restrict my food intake though. I only allow myself to drink water and nothing else. Even when my cousin came home this weekend and the temptation to drink soda was high because we were always snacking, I still did not cave in to drinking soda. I hope I would be able to keep up with this until Christmas. I will reward myself with a bottle of soda on Christmas day. Why am I doing this? I just wanted to take care of my health and at the same time look good wearing clothes I want to wear without worrying about the bulges in my midsection. I have received compliments that I have shed a few pounds already. I am flattered but in reality, I really did not lose weight. When my cousin came home this weekend, she brought with her some clothes she ordered from a designer who makes clothes that are sold by major clothing brands. Right now, I am giving up the dress she gave and hand it over to another cousin. I still have a long way to go in order to fit well into the dress. 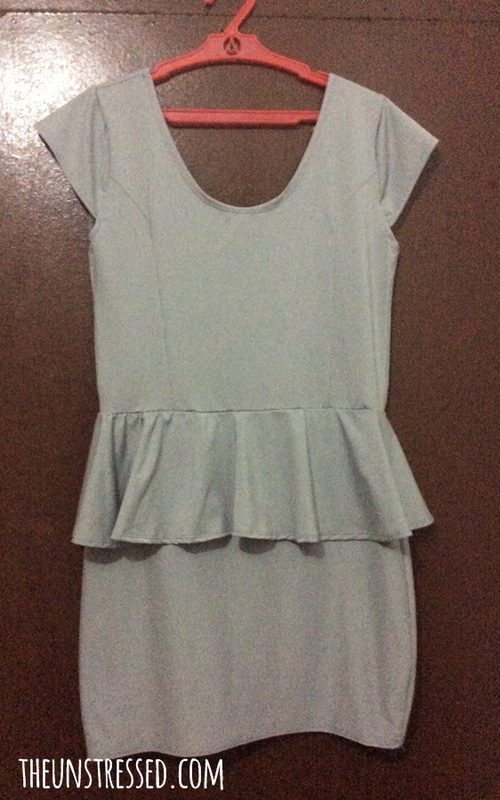 This is the peplum dress I am giving up. Even though it looks like it is my size, the hemline is too short and the fit hugs my body at the wrong places. It does not hurt that much to give up the dress since there are already a lot of shopping sites online where I can get great deals when shopping for clothes. Before even starting to browse for clothes, I visit Deals4Clothing.co.uk for discount codes. Shopping for clothes is more fun especially when I get discounts. I always keep a measuring tape close to me when online shopping for clothes to determine whether clothes would fit me or not. How about you? Do you shop online? Congrats to you. Just like you Mommy and I tried to limit our soda intake to once a week only. Hopefully we can stand this even there are many temptations around.